When selecting a home security system, people need to find a solution that meets their specific needs. Every house is different, and every family has a unique situation. Thus, a single home security system cannot be a perfect match for every family. Because every situation is individual, the best home security companies work with people to set up a surveillance system that is right for them. The ideal home security company will be large enough to offer many different solutions yet small enough to treat their customers as individuals. They should be willing to work with their customers before, during and after the installation of a home security system. Here are some specific questions people can ask a surveillance company they are considering hiring. Is There a Single Contact Person? The most personal service will come from a company that assigns a specific representative to each customer during the design and installation phase. Everyone has experienced a situation where they had to interact with several different individuals who worked for the same company. Customers become frustrated when they must explain their story to multiple employees. When interacting with a single employee, customers do not have to explain their situation time and again. It is unrealistic to think a single employee can handle every aspect of a home security system. In today’s companies, each employee is assigned to a specific department. That does not mean customers have to work with several different people. A sales representative should be willing to walk his or her customer through the entire process of design and installation. He or she should also be willing to talk employees in other departments either on behalf of or with his or her customer. Is the Home Security Company Local? With the advancement of the internet and the ability to ship almost anything overnight, companies are becoming less local. Central offices often serve large surrounding areas, sometimes encompassing multiple states. These companies either outsource onsite work to local companies or have someone travel from another city to perform the work. This is true in the home security industry, as it is in many other industries. Locally-based companies, however, have advantages over their competitors. Relying on a local security company is especially important, because only a local company can understand the security risks in their area. For instance, only a home security company in Boca Raton knows what the crime situation in Boca Raton, Florida is. A national company might have general statistics about the area, but only a local company can understand the neighborhood-by-neighborhood differences of a city or town. Crime statistics are helpful, but they cannot be a substitute for having employees that walk the streets. Only someone who lives in the area can understand his or her neighbor’s security fears and help them think through the appropriate preventative measures. Selecting a home security system is like entering into a long-term relationship. Unlike a store where customers purchase a product and leave, home security companies work with their customers on a daily basis. They do not talk to each other every day, but there is someone watching over the house at all times. Since the relationship between a homeowner and home surveillance company is ongoing, it is important to understand who the homeowner will be interacting with when they contact the company. For major concerns, who will customers talk to? Are the customer service representatives experienced in the home security industry, or are they outsourced phone operators? At times, customers have simple questions that they want answered quickly. In these situations, online support via forums and email can be preferable. If there is an onsite emergency, is there a local installer that can respond quickly? The best security company will have multiple ways to ask questions and provide several levels of support. Whose Products will be used in the Surveillance System? Some companies manufacture and install their own products, while others install products they purchased from a manufacturer. A security company that outsources the manufacturing of their equipment might be able to provide an adequate level of service, but a company that manufactures their own equipment has two advantages. First, their cameras and sensors might cost less, because they do not have to pay wholesale prices for these items. Second, if a piece of equipment malfunctions, they do not need to order a part from another company. The relationship between the home security company and equipment manufacturer is not the only criterion that people should consider. Understanding it, however, will help people choose the best company. What Pieces of Equipment are Available? Any company that installs home security systems should offer a wide array of products. A company with a limited selection of equipment will not be able to create a fully customized system. The following items will not be needed in every system, but they are all standard products in the home security industry. The control panel is the liaison between a home’s local system and the surveillance company. It is typically installed on the roof or in a centrally located closet. The control panel usually houses a siren. A local siren sounds when the alarm is activated. It alerts anyone within earshot of the emergency, and it can instill a sense of panic in the intruder. The keypad is usually located by a doorway. It is used by the homeowners to activate and deactivate the alarm. Motion detectors use infrared technology to detect movement. If strategically placed, a single motion detector can monitor several rooms. Contact sensors are used on doors and windows. They monitor when these potential points of entry are open or shut. Glass break sensors are used either in conjunction with contact sensors on windows or in place of them. Glass break sensors can tell through sound waves when glass has been broken. Thus, they are able to detect entry through a window, even if it is never opened. 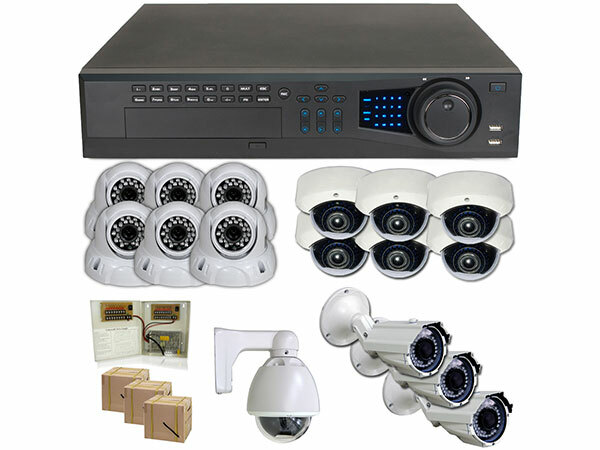 The above items are all standard products that every home surveillance company should offer. The following list is for people who want the greatest level of security possible. Most home security systems do not include a camera system, but those who want one should select a surveillance company that has the following products. Some people use dummy cameras in place of actual cameras, in order to save money. Although fake cameras do not record any video, they appear to record nearby activities. When placed in visible areas, these can deter criminals. Cameras that are used outdoors are typically larger than those used indoors. 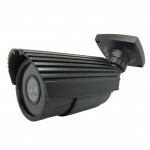 Outdoor cameras must be durable enough to withstand the elements. They also are usually placed in prominent locations, so people know the home is under surveillance. Cameras that are used indoors are typically small and inconspicuous. Their purpose is not to deter vandals and burglars, but to record any crime that takes place. Because homeowners do not want these to detract from the home’s décor, they should not be very noticeable.. Selecting the location of cameras is only the first step in installing a home surveillance system. Installed cameras must be monitored, and recordings must be saved. Here are some further considerations about a home surveillance system. Some home surveillance systems are actively monitored, but most systems simply record video for evidence. If a system is to be actively monitored, then the company must provide such a service. It is impractical to think a family will spend their time watching their own security system’s video feed. For systems that are not actively monitored, fixed cameras are adequate. Systems that will be monitored by a surveillance company, however, should have flexible cameras. Flexible security cameras allow the monitoring service to angle the camera in the best direction at any given time. The location of a surveillance system’s recorder affects the level of security it provides. If data is stored on site, it can be stolen during a crime. Even safes can be hacked into. The most secure recorders are located at an off-site monitoring station, where they cannot be stolen. The best home security company in any area will treat their customers like people. They will be locally based and serve their neighbors. They will also be willing to walk people through the entire process of selecting a home security system, having it installed and understanding how it is monitored. People who are looking for a high-quality home security system should first look for a good company. They should seek out a company that is willing to explain every product and its uses. After people find someone who is willing to provide old-fashioned customer service, they can begin to ask about the items mentioned in the above lists.